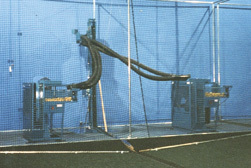 Master Pitching Machine offers several designs of baseball batting cages for both indoor and outdoor use. Over forty years of experience have gone into making our baseball batting cages economic, attractive, and easy to install. 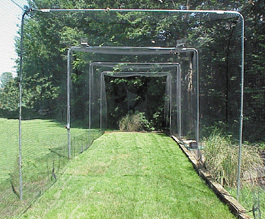 All baseball batting cage and backyard batting cage packages consist of galvanized steeel pipes, custom-made fittings, and custom-sized netting. All pipes, except the monopole center pole, are galvanized steel to provide exceptional durability and resistance to rust. All fittings are custom welded with set screws used to hold the fittings and pipe together. As a result, no welding is needed to erect the baseball batting cage framework. All nets are black, nylon, 1-2/3" square mesh, and treated with a special coating to help prevent damage from the sun's ultraviolet rays. 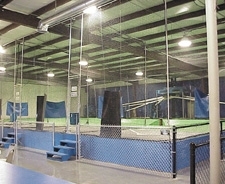 Our Standard Indoor Automated Batting Cage is the most commonly used indoor coin-operated batting cage system. Each stall is 14' wide x 14' high x 58' long. In automated batting cages with more than one stall, a short divider net separates the batters. If an elevator system is being used to pick up the balls, either a wooden desk witha sloped floor or a sloped concrete pad is needed. This cage can be easily modified to fit a particular location. We also offer the E-2 Automated Batting Cage, a two-stall standard indoor coin-operated batting cage that utilizes an E-2 elevator System in which a conveyor betlt runs down the center of the cage and carries the balls back to the elevator which then re-feeds the machines. Our A-24 Polyball Automated Batting Cage is a coin-operated batting cage that not only throws poly balls, it picks them up as well! It is designed to use only 12' x 30' of floor space, and is greaet for small spaces. We have many different options for outdoor coin-operated batting cages depending on the size of the area you will be using. 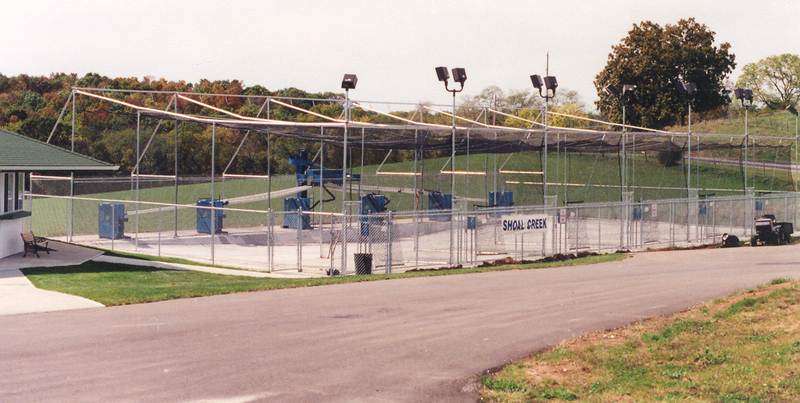 Our automated batting cages offer the coice of rectangular cages, radial cages and tent top Monopole designs. Our baseball batting cages are designed to fit the average sized backyard, and are perfect for any baseball loving family. Any budding baseball player's hitting skills will clearly benefit from being able to practice any time they want in their own backyard batting cage. When you order baseball batting cages from Master Pitching Machine, you will receive detailed installation plans along with the equipment. These plans include all of the conrete or wood floor details as well as the best methods of erecting the cage framework, hanging the netting, and intalling the pitching machines. From the initial installation through on-going support and cutomer service, each customer remains a priority. Once you are committed to Master Pitching Machine we, in turn, are committed to you.